Kyodo News International: America's link to Asia. Kyodo News International (KNI), a New York-based subsidiary of Kyodo News, is responsible for worldwide marketing of Kyodo's news and photo services. Since its inception in 1982, KNI has steadily expanded its market base from traditional media to government, business and financial circles with transmission means convenient for their specific needs. 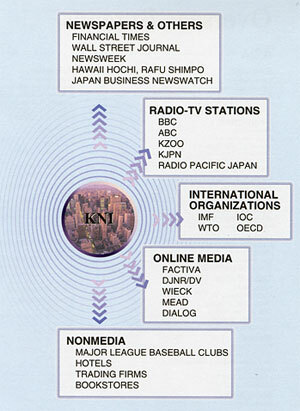 KNI serves as an outlet for concluding subscription contracts with non-Japanese news media and international organizations. Major subscribers include the Financial Times, Bloomberg, BBC, the Nation (Thailand), the South China Morning Post (Hong Kong), the International Monetary Fund (IMF), the World Trade Organization (WTO) and the International Olympic Committee (IOC). KNI also handles the international distribution of photos. Kyodo includes among its customers, Time-Life, Business Week, Newsweek, Forbes, Fortune, Economist, Sports Illustrated, to mention only a few. All Content Copyright © 2019 Kyodo News International, Inc.